Did you know that much of Southern California's coastal area used to be marshland? I didn't. My husband and I visited the Madrona Marsh Preserve in nearby Torrance for the first time this week. Hidden in plain sight, surrounded by condos, gas stations, retail stores and a stone's throw from a major shopping mall, neither of us knew much of anything about it. I knew that it offered birds a sanctuary within this urban area, mainly because my mother-in-law, an avid birder, used to visit there to observe migrating birds. I learned that it was scenic from a friend who visits seeking inspiration for her paintings. 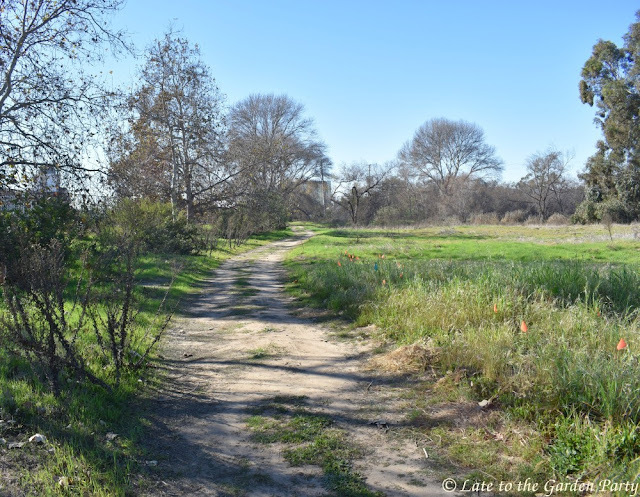 But, despite passing the area more times than we can count during the years we've lived in the South Bay, neither of us had ever visited the Preserve. Of course, visiting a marshland in the middle of the driest rainy season I can remember probably wasn't the best choice for our first visit but one takes these opportunities when they present themselves. If nothing else, with the weather here still on the unseasonably warm side, it was a pleasant day for a walk. 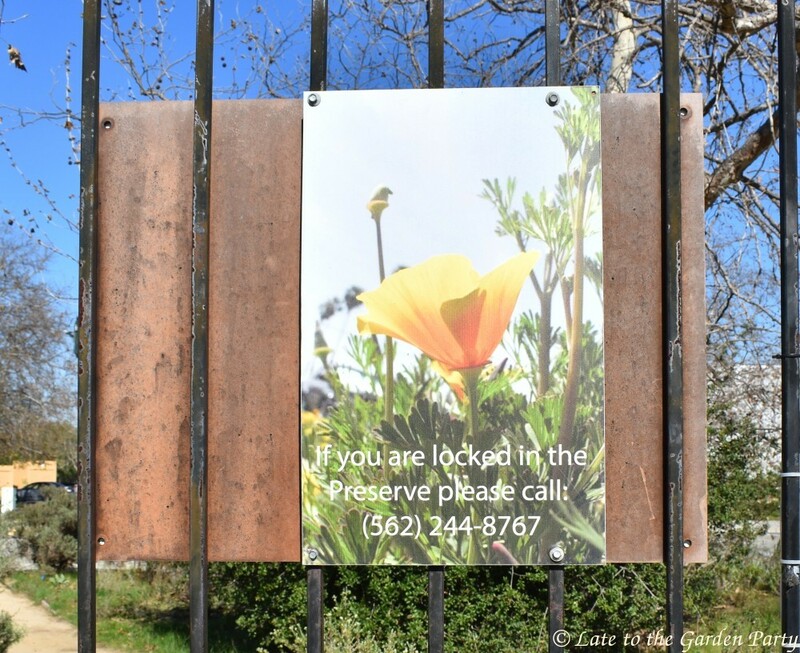 There were many signs within the gated Preserve to remind you of the fragility of the space. This sign, posted on the back of the metal gates through which we entered, had me double-checking that I had my phone with me. 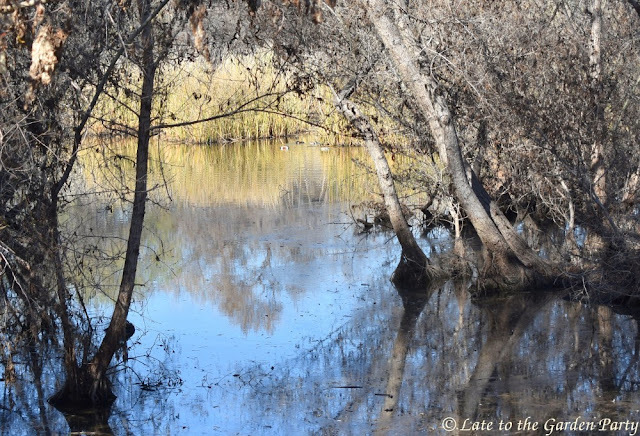 The vernal pool areas featured sticks to measure the water level. As best as I was able to tell, all measured zero. We passed a biofiltration system before heading toward the wetland area. This biofilter system is set up using a perennial grass from India to filter contaminants (heavy metals, pesticides, and other chemicals) carried into the area by urban runoff before directing the water to other areas of the wetland. It was dry at the time of our visit. The flags along this path signify new native plantings. Very little is currently in flower so you won't see my usual splashy flowers in this post. 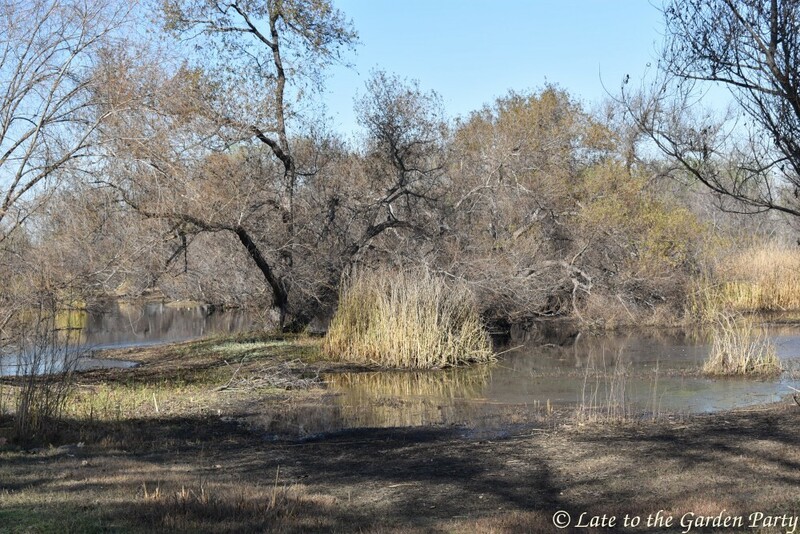 As we approached the wetland area, we saw the grass-like tule first. Tule (Schoenoplectus acutus) is a giant species of sedge native to the freshwater marshes throughout North America. We could make out ducks from a distance but the paths kept us from getting too close and some areas were fenced off to protect them from being disturbed. The Preserve's website has much better photos of the many birds known to migrate through the area, including hummingbirds, woodpeckers, hawks, egrets, and herons. The Preserve's winged visitors even featured in a float at this year's Rose Parade. This was my best duck photo. 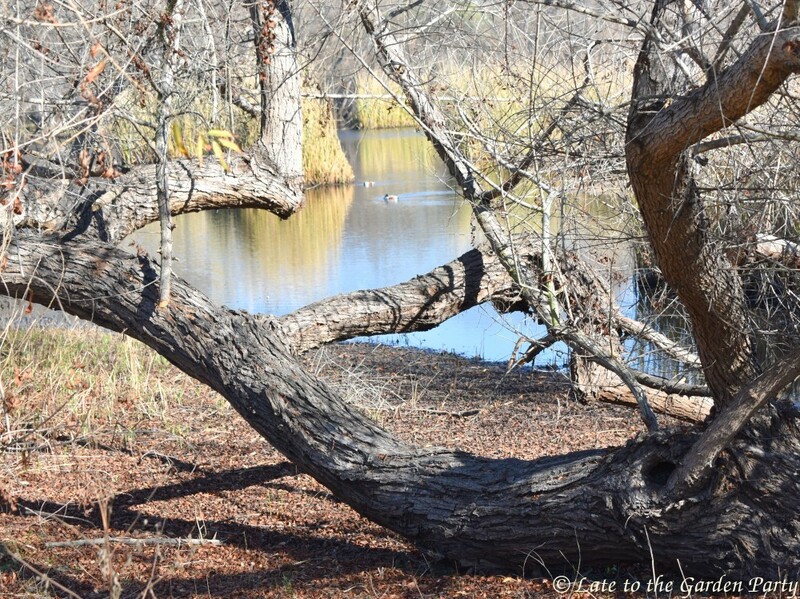 My husband spotted 2 geese sunning themselves on a berm in the middle of the pond but my photo is too fuzzy to share. As we headed back toward the entrance, we spotted the on-site nursery, where native plants are grown to be planted out within the Preserve. 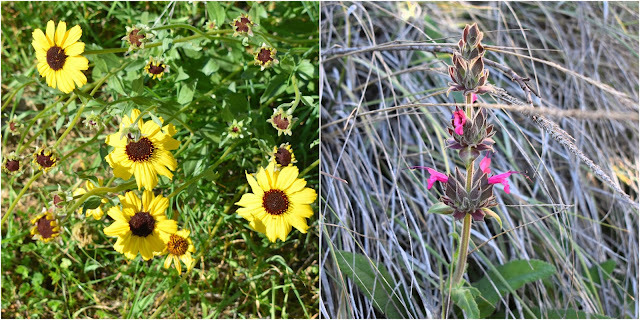 There are much better photos available on the Preserve's website, taken during greener periods. We'll definitely visit again, hopefully after there's been some rain. (I still have hope!) 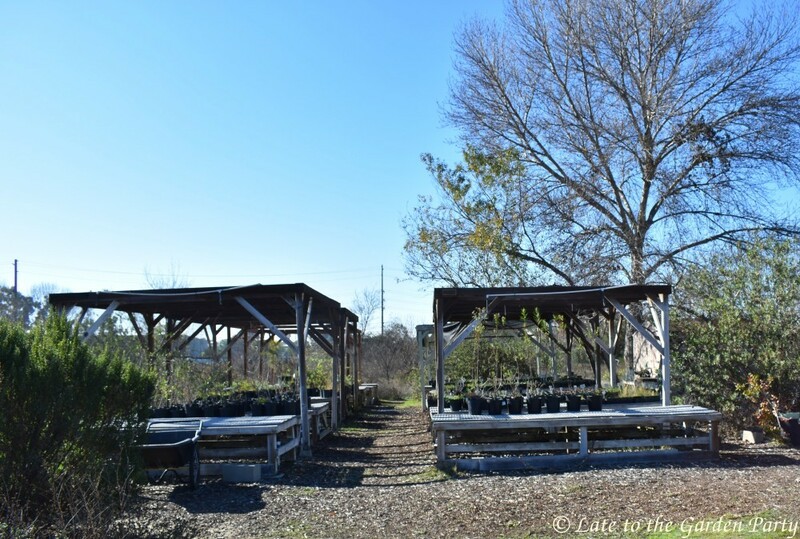 There's ample parking outside the Nature Center across the street and entrance is free. Although flowers were in short supply during our visit, I was attracted by a couple of natives and may hunt these down for inclusion in my own garden. Best wishes for a pleasant weekend! What a glorious oasis. It's so peaceful walking alongside water, with just the quacking of the ducks. Some of those later shots could almost be England (with less blue sky). 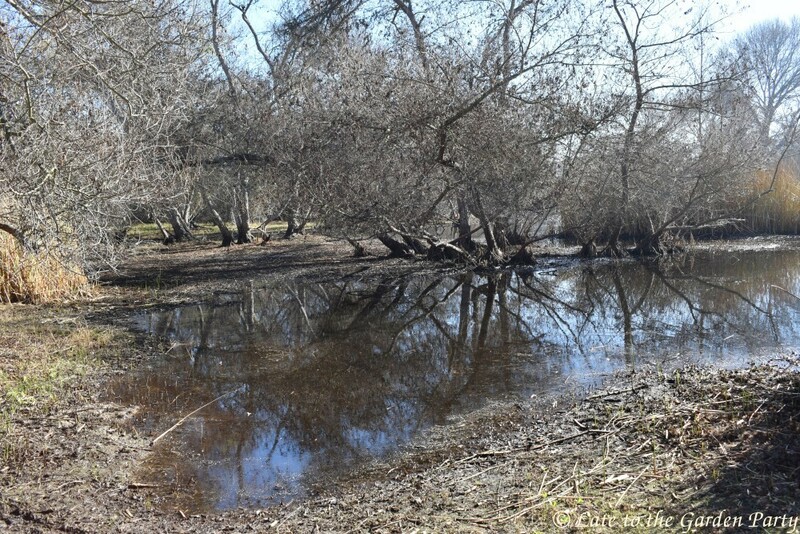 You don't find a lot of natural ponds here in Southern California, at least not anymore, Jessica. 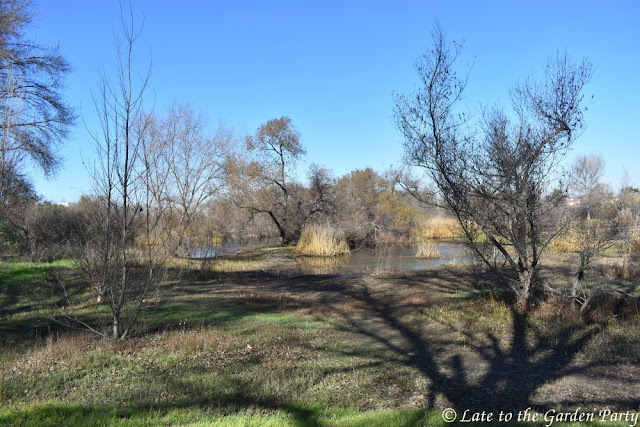 The wetland area was fairly near the busy street that runs along the south side, making the ducks' chatter harder to hear than the birdsong in the open areas toward the middle of the preserve. This was a nice and unexpected change of pace for your blog, I loved it. I've never heard of tule, and had no idea there were wetlands in Southern California (especially wetlands that might actually still be wet). I'm torn on what to do for the weekend. Our weather should be dry, but not that warm, so I'd like to get out in the garden, but I also have almost 1,000 photos to sort through of the NWFGS. Must have been relaxing going through it. It WAS very peaceful. There were very few other people there during our visit - just a jogger, a few walkers, and a couple of workers. I didn't see any birders, which led me to suspect that no new migrating flocks are currently in residence. 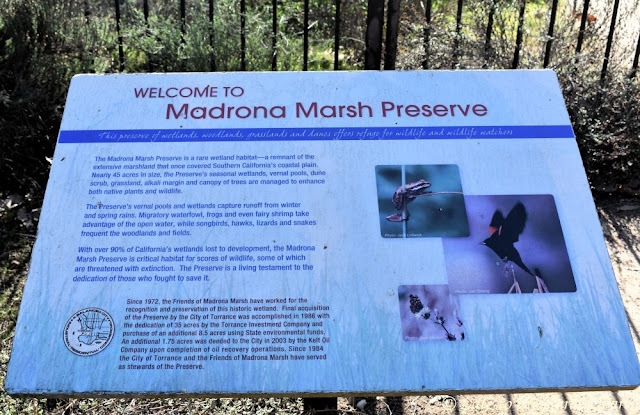 I drive by the Madrona marsh all the time too but have yet to pay a visit. Thanks for making it real! Based on the photos on the website, it's often a lot more colorful and much prettier than it was during our visit. 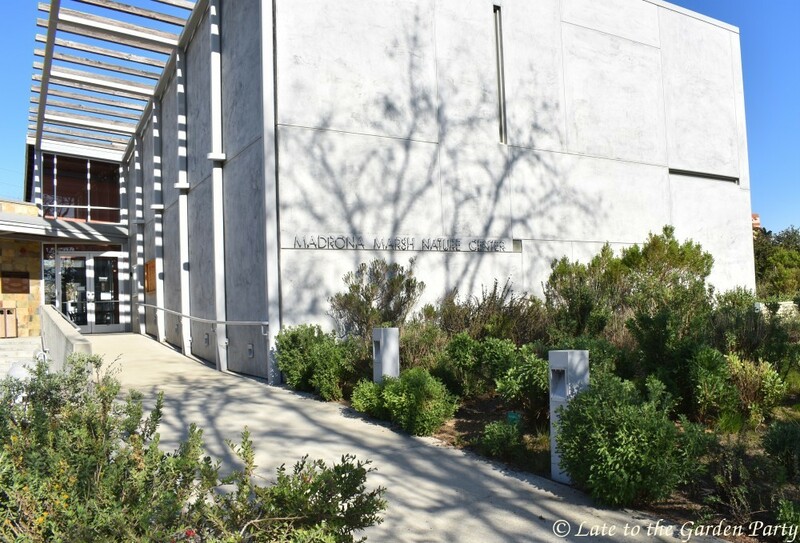 If you're at all interested in birds, they also have regular hosted tours. I'd no idea that much of Southern California's coastal area used to be marshland. How wonderful that some of it still exists. 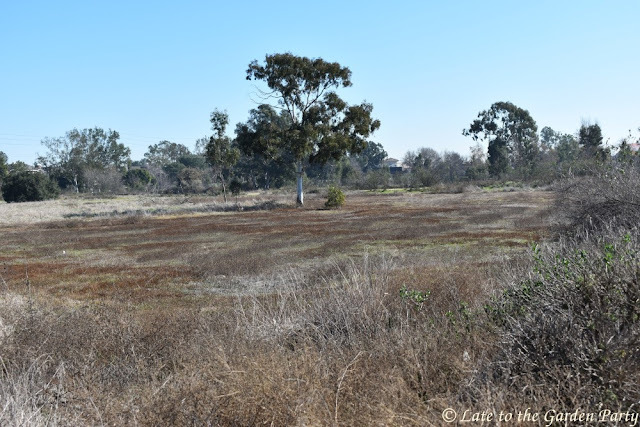 Just 10% of the marshland still exists in SoCal but that's apparently the cost of the rampant development supporting our very large population. A small preserve in the middle of the city - what a treasure! 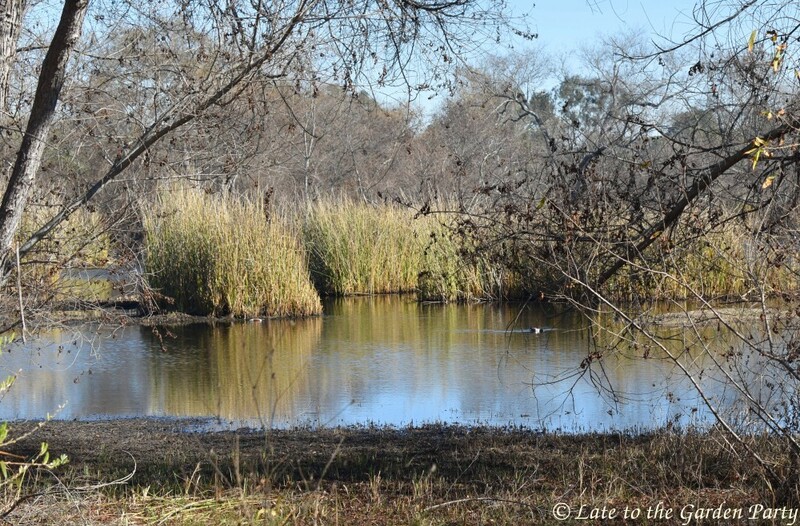 It's a pity wetlands were once considered worthless. Now we are a bit wiser and some are actually being restored. They are a haven for birds particularly. I can see from the website that the water levels are down quite a bit, alas. We've only had one real rainstorm this season (since October 1st) and that was in early January so we are exceptionally dry, even by our standards. There's a chance of rain starting Monday night, though! I’ll admit, I was holding my breath for fear there would be no water... thank god there was. What a surprise for something like this to be in Torrance, CA. Honestly, I was a little worried there'd be no water either but, luckily for us and the ducks, there was! The ponds are clearly at a low level but maybe the rain predicted for later this week will help some. 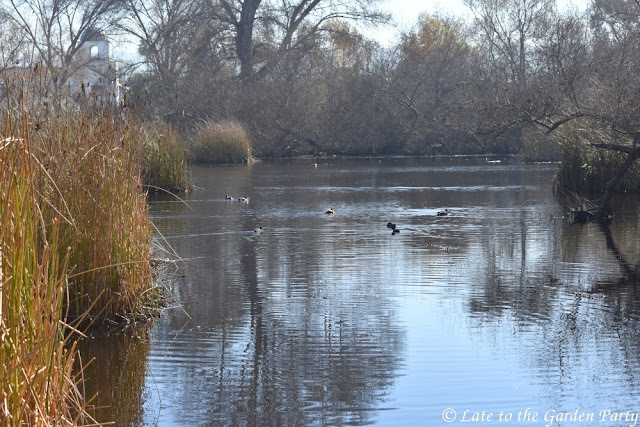 It is wonderful that you still have these wetlands and more so, that they are being preserved. We just had a storm waste water area converted to a wetlands preserve in the town next to us, which I just toured this past summer. 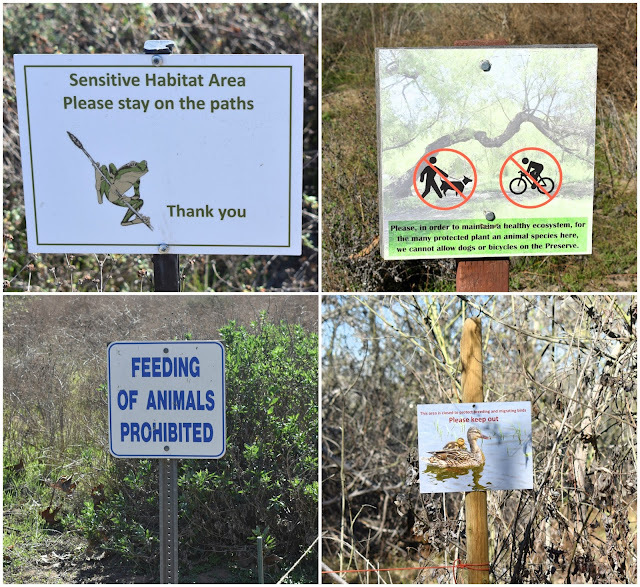 It is so refreshing to see that these areas are being protected. Thank you for sharing this. 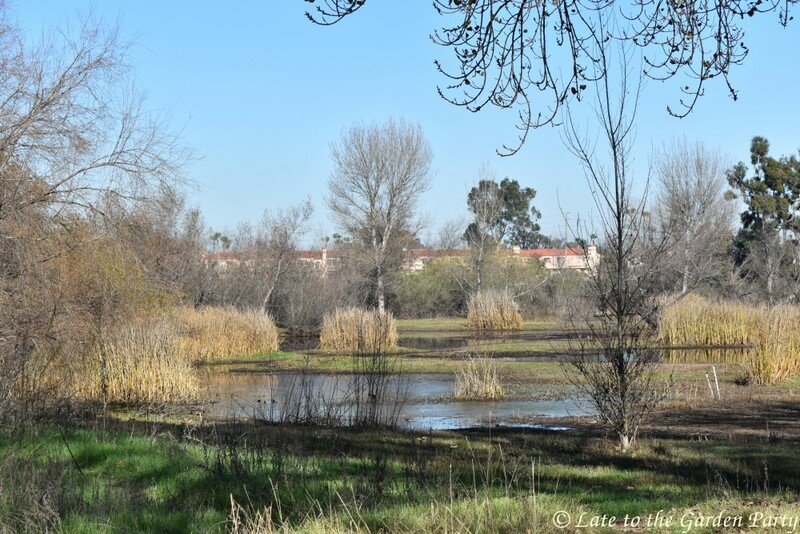 Wetlands aren't something generally associated with SoCal. There's another one, Ballona Creek, near Marina Del Rey, which again I know of mainly due to my mother-in-law's prior involvement in protecting it. What a treasure in the middle of all that development! Parts of it look very much like coastal South Carolina in early spring.. Surrounded by busy streets and businesses on 3 sides, the marsh is pretty well camouflaged, Libby! I'm glad I finally made time to visit. It's a shame that your area is suffering from drought again after a brief respite. Rain is often feast or famine it seems and climate change is likely to make the contrasts even more drastic. It's wonderful that wildlife has this oasis in the middle of an urban area! Oases like this are so valuable and very much needed. The weather extremes associated with climate change are becoming increasingly frightening. I'm wondering just how many major hurricanes it's going to take before the federal government wakes up. The wetland area with the giant sedge is quite beautiful, and I am reminded by the condos that though humans did not plant it or fertilize it, we could easily destroy it. Hoping for rain for you and all those so desperately needing it in your part of the world. The fact that this preserve has held on for almost 50 years in the middle of a very congested city sitting in the middle of a densely populated county in the most populous state in the US is incredible. There are some clouds in the sky this morning but no rain yet; however, I remain hopeful. There's something like that in Gardena also, Gardena Willows Wetlands, between Normandie and Vermont, on 170th. Gardena may have gotten its name from the green vegetation that stayed green year round because of the presence of water. Amazing, never knew about those two places when I lived there. Do you remember the fogs in the San Joquin Valley used to be called Tule fogs? Before it all became farmland. I remember the term "tule fog" but that's about it - I've never seen one. 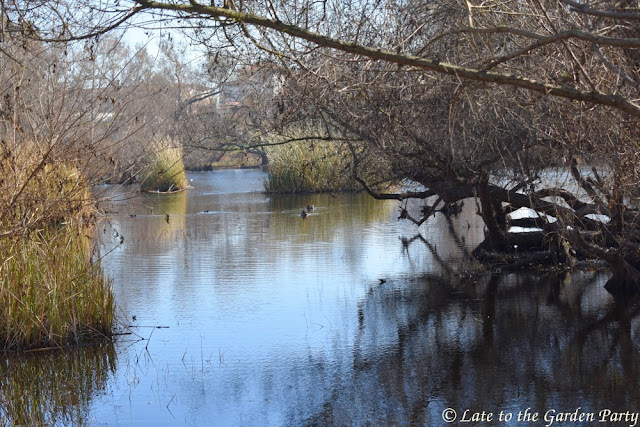 There's wetland in Marina Del Rey too - the Ballona Creek preserve, which my MIL was actively involved with. In fact, we had a memorial bench dedicated to both my in-laws placed there after she passed away. This is so different from anything else you've ever shared. It's a beautiful place. It is beautiful, if currently drier than it should be, Christina. I look forward to seeing it again in a greener state. Oh this is wonderful....who knew such a wonderful preserve was there and I loved reading about it....I will note it in my files in case we get a chance to be nearby someday!! It's an easy place to visit, Donna, at least during its open hours, 10am-5pm, Tuesday through Sunday. No admission fee and easy parking too. The only difficulty is finding it, surrounded as it is by city trappings. Drought is also making Cape Town rethink wetlands and canalising rivers to take stormwater away to sea. Instead of letting it recharge groundwater. As land prices have been sky high for a long time here and pressure to sell off land to developers is fierce, I'm impressed that the land preservationists have been able to hang onto the Torrance property, Diana. So few members of the public, not to speak of politicians, seem to have long-term perspective.